This entry was posted in blog, Motherhood and tagged marriage, parenting. Bookmark the permalink. He never says anything about it but, 3 years into our marriage I became disabled. I’m nothing like I was before. 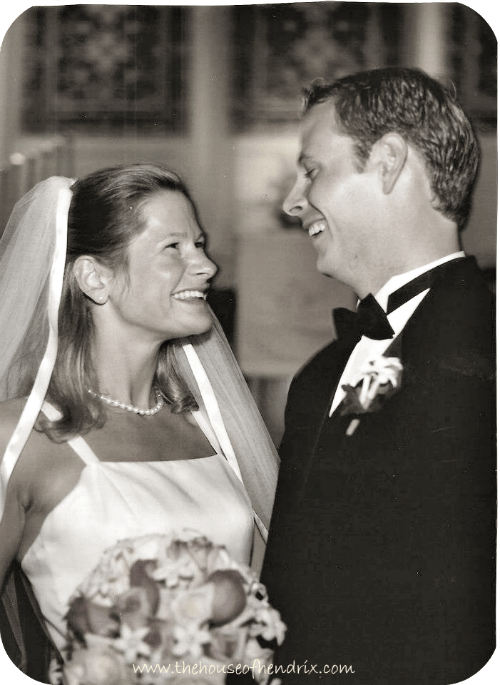 I know he still loves me, maybe more, but I am positive that we BOTH wish I was still the girl he married. Awe. My eyes full of tears. At this moment, I am praying over your marriage, your body, and your future…that even with your new limitations you have a life of great joy. Insightful. Sometimes I miss who he was and realize he must be missing who I was too. Haha! Yes, I intentionally did not go there. That’s a much easier post to write, isn’t it? Yes, yes. Lol me too…I was going to show my husband this blog and then I thought… nah don’t remind him. It does help me validate for myself that we are new people and it’s ok. So thank you! Thanks Kara. You made me laugh. Wow this couldn’t be more perfect for my marriage! You have left me in tears. Every.single.day I ask myself the same question you have posed. Everything was great the day we got married, and then we were faced with five years of infertility, seven miscarriages and finally our son was born. I thought we would finally be “that happy family”. I was wrong! Something with my pregnancy hormones opened up Pandora’s box and I started having epileptic seizures like crazy. I went back to work when my son was 2.5 thinking I needed a break and wanted to help contribute to the family but all I did was ruin our family a little more. I took a horrible job that I knew better not to take. I was driving down the freeway on a Saturday night and started having a seizure. I crashed into a freeway overpass. By all odds I should be dead but only broke my leg and ankle in six places. After this the seizures were unstoppable! It was determined I needed brain surgery to remove my right temporal lobe and part of my hippocampus. My husband has been my rock through the last three years of hell. I often wonder if he only knew that this is how our lives would have turned out, would he have picked me? I think all of your husband’s experiences prior to your marriage shaped him with great purpose, and that purpose was to be your rock. Sounds to me like you all have persevered and then some. What incredibly strength your family has! Thank you for sharing your story. Keep me posted. Thank you so much for sharing your heart AND for gracing the Memoir Monday hop with your beautiful words. I can SO identify with your sentiment here and I love how you express the feeling that I too have…I am sure many have as well. Lovely blog.It’s so nice to “meet” you!! Nice to meet you too 🙂 Oh and the name of your website is the cutest thing ever! Love this. Found you on theresonemommy Facebook link. Liking your page now to follow. Life before kids IS simpler, but, like you, I don’t miss that girl I used to be. She’s become something much more. And, yes, I’m exhausted most nights, so is the husband! But in a good way. What a sweet post. I agree – sometimes I miss that girl, but I also wouldn’t give up what I have now, even if I am exhausted and not as much fun!! 🙂 So glad you linked up with us at pin it! Tuesday! Honestly, I thought this post (from the link I clicked on) was going to be about did *I* miss the girl I was on my wedding day. I didn’t even think about my husband’s perspective. We’ve been married for almost four years and have a one year old, so it’s not as though things haven’t changed. I think the poor guy is used to a constant stream of reflection from me – about how I’m changing, about how the baby’s changing. 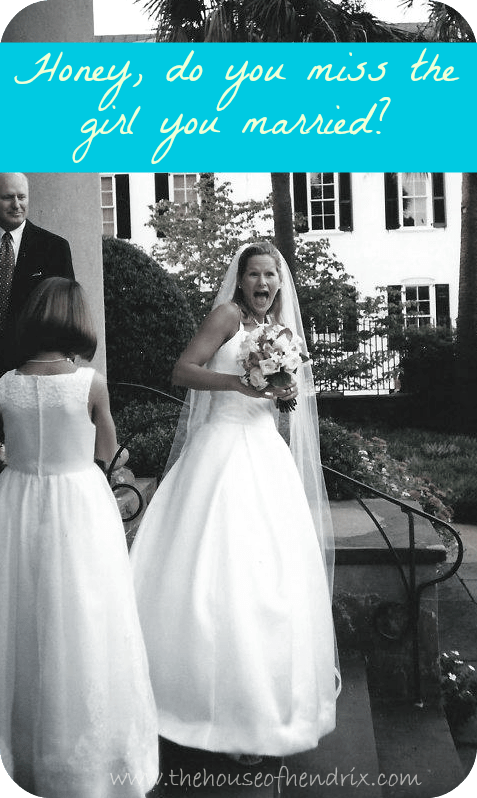 I was a nervous bride, and now I’m a nervous mom, and I don’t miss the girl I was on my wedding day. Internally, I’m just better with four more years of life experience. Maybe when I have a four year old, I won’t miss this me either! Thanks for letting me think it through. First off, thank you for sharing this piece of your heart. Marriage is hard, isn’t it? Your comments made me think of a scripture in 1 Peter 3 which talks about winning your husband over not with words (or through fighting) but through your actions. My prayer for you is that you will cling to God for your security, that you will speak and act in such a way to honor Him, and as a result your husband is going to be drawn to you…not your appearance but the beauty of your heart. Praying over your marriage now my friend. Keep me posted. I miss her. I miss what she could get up to. It’s not that I don’t like who I am now, or what I’m doing now, but I still think fondly of the antics she used to get up to. I happened to stumble upon your blog through Pinterest and oh boy, this is what I needed! I too, have 3 little ones and oddly enough, a Palmer as well! 🙂 So many of your previous post’s have touched me in many ways. Especially since our weekend was full of many trying moments with our kiddos. Thank you for bringing some calm and inspiration to my morning. I look forward to enjoying your blog. Have a wonderful week! I just found this via pinterest. Thank you. I needed this, very badly. I miss the girl I was 13 years ago too. Many regrets on my end. I miss her deeply. Glenda, I hope this helped sort through that a little bit. I’m glad you stumbled here tonight and I’m happy to connect with you.